This paper considers the impact of the intellectual property (IP) system on the timing of cooperation/licensing by start-up technology entrepreneurs. If the market for technology licenses is efficient, the timing of licensing is independent of whether the patent has already been granted, and productive efficiency considerations will determine license timing (which likely will be as early as possible after invention). In contrast, the need for disclosure of unprotected knowledge on the part of the inventor, asymmetric information between the licensor and potential licensees, or search costs may retard efficient technology transfer. In these cases, reductions in uncertainty surrounding the scope and extent of IP rights may facilitate trade in the market for ideas. Employing a dataset which combines information about cooperative licensing and the timing of patent allowances (the administrative event when patent rights are clarified), we find that preallowance licensing is quite common, occurring in about 27% of our sample. Furthermore, the administrative resolution of uncertainty over patent rights significantly increases the hazard rate for achieving a cooperative licensing agreement, and this effect is particularly salient in the period immediately following the patent allowance date. Finally, the impact of the patent system depends on the strategic and institutional environment in which firms operate. 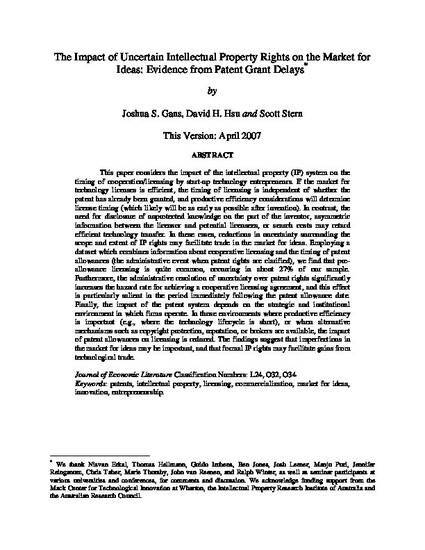 In those environments where productive efficiency is important (e.g., where the technology lifecycle is short), or when alternative mechanisms such as copyright protection, reputation, or brokers are available, the impact of patent allowances on licensing is reduced. The findings suggest that imperfections in the market for ideas may be important, and that formal IP rights may facilitate gains from technological trade.